To enquire about this artwork or to order a private commission of any wildlife or animal drawing or painting, please contact the artist. 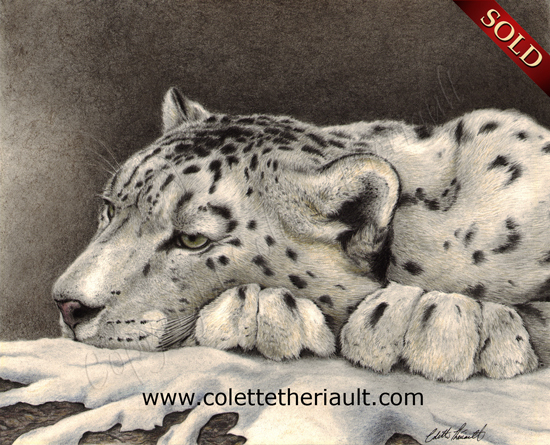 Sadly, the secretive snow leopard (Panthera uncia) is one the rarest of the endangered big cats. There may be fewer than 3,500 of these felines left in their native habitat. This beautiful spotted white cat lives in the cold harsh environments of rugged mountains in central Asia, at elevations between 3,000 and 5,400 meters above sea level. They patrol steep cliffs, outcrops and ravines looking for their prey which include wild sheep, goats, ibex, marmots, hares, rodents and birds. Being opportunistic, their lives are often at risk when they feed off farmer's livestock. This may happen when the snow leopard's habitat is destroyed and/or prey loss forces the cat to hunt elsewhere. Other factors that contribute to the snow leopard's dwindling numbers include poaching and lack of awareness, political instability, lack of money to educate and enforce laws and the difficulty in catching poachers in the snow leopard's remote and rugged habitat.